In an age when many leaders desperately seek their 15 minutes of YouTube fame, Dr. Dorothy Irene Height was celebrated by presidents and everyday citizens alike for being the rarest of all humans -- a servant leader. In the Spirit of Jesus Christ, Dr. Height, who died recently at the age of 98, stated in her remarkable memoirs, Open Wide The Freedom Gates, her singular purpose of a life of service and leadership. In Open Wide, she tells of being scolded by her mother for laughing at a young boy her age who could not remember the words to his short Easter speech, while she recited her longer speech perfectly. She received a 'tough love' lesson in servant leadership from her mother, who she said, "helped me to understand how not to show off what I knew, but how to use it so that others might benefit. She always kept before me my responsibility to other people . . ."
Jesus spoke of leadership from a different point of view and Dr. Height got the message. He told his disciples who argued over who would be first in God's kingdom, telling them "whoever wants to be great among you must be your servant." Of himself, he said, "I came not to be served but to serve." The message of servant leaders contrasts sharply with the prevailing top-down leadership of our time. Jesus' message of serving as a number one priority, then leading with serving others in mind, was not lost on Ms. Height, as many lovingly called her. It was not lost on her growing up in the coal mining town of Rankin, Pennsylvania, when she taught Bible lessons to foreign-born white children at the Rankin Christian Center. She saw everyone in need, whether immigrant or citizen, as a child of God, and served in that spirit. Nor was the lesson of being other-centered lost on Dr. Dorothy during the 1963 March on Washington. As the only woman slated to speak at the male-dominated historic march, she voluntarily gave up her time slot so that at a young leader named Martin Luther King Jr. could have more time to share his now famous "I Have A Dream" speech during prime television viewing hour. For more than eight decades, Dr. Height sat through meetings aimed at improving human conditions, listening intently, oft-times knitting, always decked out in her signature hats, quietly sharing her wisdom as she felt it appropriate. Her focus was never on being the only African American or woman in meetings with well-known leaders. Her life-long commitment was to ensure that no matter who was in a meeting with her, or the topic of discussion, the needs of the underserved stayed at the center of the dialogue. While others sought the limelight, Dr. 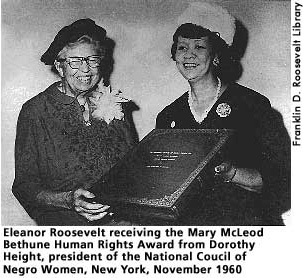 Height -- through wars, 10 administration changes, and countless struggles on behalf of people of every background against discrimination and degradation -- kept her eye on the prize. Her prize was simply serving those who had no voice, little hope, and few options in life. Always immaculately dressed with stunning matching hats, Dr. Height's spirit of servant leadership was seen in the way that she showed up, whether at a rally, a women's rights meeting, a congressional hearing, at White House briefing or a community gathering. She added an air of dignity and "somebody-ness" to every occasion as if to represent both in style and substance, the left out, the locked out, and the last to benefit in society, because they mattered so much to her and to the God she served. Dr. Height will always be remembered for another powerful trait of a servant leader. She practiced civility and respect for the dignity of all others, even those with whom she disagreed. Hers was the kind of civility so desperately needed in an age of name calling and vicious labeling among far too many leaders of all political persuasions today. For Dr. Height, a dignified, decent, and dedicated servant of God, the issue was not about being right and proving the other person wrong. The only issue was on 'doing right' for those whom one of the world's riches nations had 'treated wrong' ... for so long. What a treasure our world has been given through the amazing life and remarkable legacy of Dr. Dorothy Irene Height. She walked among us as one who served, as we are all the better for it. Dr. Barbara Williams-Skinner is co-founder and president of the Skinner Leadership Institute.